Prumus mume (Sieb.) Zieb. et Zucc. Botanical Name: Prumus mume (Sieb.) Zieb. et Zucc. Source of Earliest Record: Bencao Gangmu. Description: Prunus mume is a deciduous tree that starts flowering in mid-winter, typically around January or February in East Asia. It can grow to 4–10 meters tall. The flowers are 2-2.5 cm in diameter and have a strong fragrant scent. They have colors in varying shades of white, pink, and red. The leaves appear shortly after the petals fall, are oval-shaped with a pointed tip, and are 4–8 cm long and 2.5–5 cm wide. The fruit ripens in early summer, around June and July in East Asia, and coincides with the rainy season of East Asia, the meiyu (梅雨, literally "plum rain"). The drupe is 2–3 cm in diameter with a groove running from the stalk to the tip. The skin turns yellow, sometimes with a red blush, as it ripens, and the flesh becomes yellow. The tree is cultivated for its fruit and flowers. 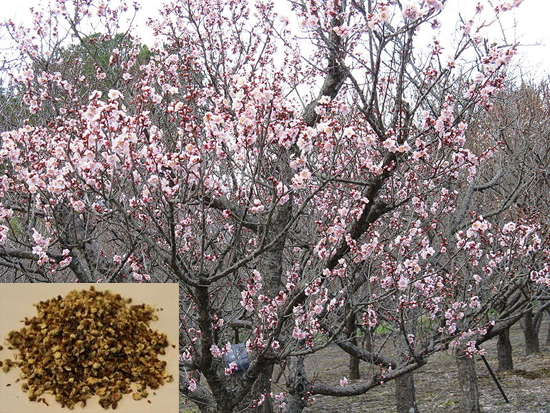 Distribution: Prunus mume originated in the south of China around the Yangtze River and was later introduced to Taiwan, Korea, Vietnam, Laos, and Japan. It can be found in sparse forests, stream sides, forested slopes along trails and mountains, sometimes at altitudes up to 1700 to 3100 meter, and regions of cultivation. Part Used & Method for Pharmaceutical Preparations: The flowers or flower buds are gathered in January or February and dried in the sun or baked. Properties & Taste: Sour, astringent and neutral. Functions: 1. To promote the free flow of qi in the liver and reduce stagnation; 2. To regulate qi and harmonize the stomach. 1. Qi stagnation in the liver and stomach manifested as distension and pain in the hypochondriac regions, belching and epigastric pain. Mume flower (Lu'emei) is used with Bupleurum root (Chaihu), Cyperus tuber (Xiangfu), Green tangerine peel (Qingpi) and Costus root (Muxiang). 2. Phlegm and qi stagnated in the throat (globus hystericus) manifested as the sensation of a foreign body in the throat. Mume flower (Lu'emei) is used with Trichosanthes peel (Gualoupi), Tangerine peel (Chenpi), Mulberry bark (Sangbaipi), Albizia bark (Hehuanpi) and Perilla leaf (Zisuye). Dosage: 3-6 g, decocted in water for an oral dose.